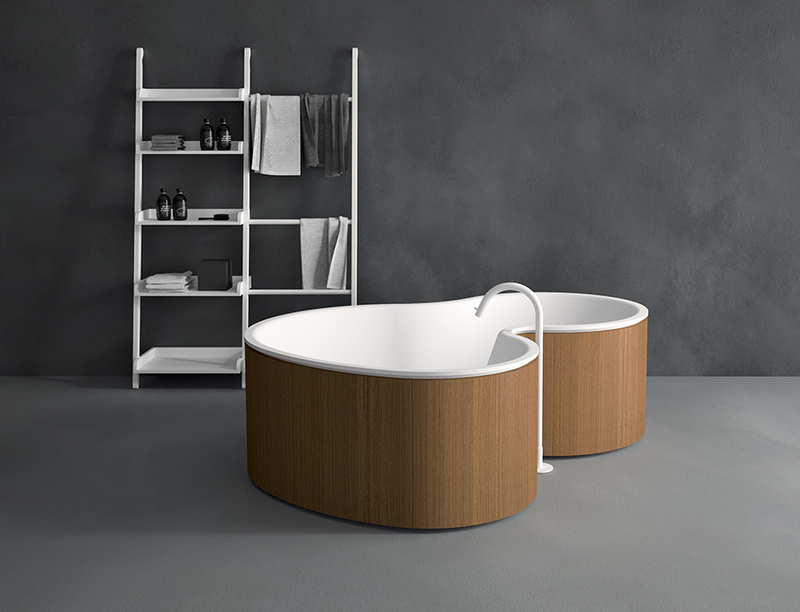 Brazilian architect Marcio Kogan gets in the product design game with a curvy, organic bathtub for Italian brand Agape. The DR tub by Marcio Kogan for Agape is made from curved wood on the outside and solid-surface on the inside with taps that can be installed on the wall or floor. Bathing in a tub can be a sublimely luxurious experience, whether you opt to steep in a no-frills hot soak or indulge in a bubbly affair. The architects at Studio MK27, Marcio Kogan’s renowned São Paulo firm, sought to create a tub that expressed the minimalist designs for which they’re known. They collaborated with Italian company Agape on the DR, a sinuous, wood-clad showpiece built for two.